Will we get the typical seasonal rally into the last 6 weeks of the calendar year ? The earnings update will be out Sunday morning, November 19, 2017. Today, given its mid-November, readers should probably see the continued out-performance of large-cap growth (most of which is Technology, but not all). Note how “growth” is continuing to distance itself from “value” across all the equity asset classes, i.e. large-cap, mid-cap and small-cap. Only in small-caps has the “growth” premium not really expanded in 2017. 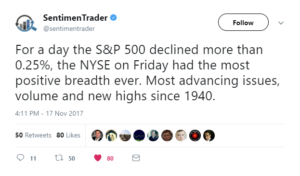 Last year in mid-December ’16, we thought the SP 500 could be up 20% in 2017 and it turned out to be an OK call. We’ll see if in the last 6 weeks the S&P 500 can get the last 2.5% into the year’s close. Next year might be different – note how in 2016 the Russell 2000 and small-cap had a far better year than the SP 500 and large-cap growth. This year that dynamic flipped completely. Value had a good year last year as well, and a lot of that could have been the Financial bounce after the 2016 Presidential election. Here is another perspective from Norm Conley who runs JAG Capital Management, or his own shop in St. Louis. Apologies for the technical issues. If this link doesnt work, check the JAG Capital Management website. In Mid-December, this blog will have the 2018 “expectations” and some thoughts on asset allocation. Thanks for reading – more on earnings tomorrow. Q3 ’17 earnings were solid, and so will Q4 likely be as well.